Baugh's Blog: Book Review: Charles Dickens 16 - "A Christmas Carol"
Book Review: Charles Dickens 16 - "A Christmas Carol"
I didn’t plan to include A Christmas Carol in this series of blog posts about the novels of Charles Dickens. But, then again, I did include Sketches by Boz at the beginning of this series – and that, too, is not one of his novels, it’s a collection of sketches and tales originally written for newspapers and magazines. So, as a special way to mark this Christmas Day of 2012, here’s a review of one of Dickens’s most popular works. Merry Christmas! Charles Dickens first conceived of the story that became A Christmas Carol on a short trip to Manchester in 1843. He was there to give a benefit speech at the Manchester Athenaeum – an educational enterprise. His speech helped raise funds used for the education and recreation of labourers in that city. 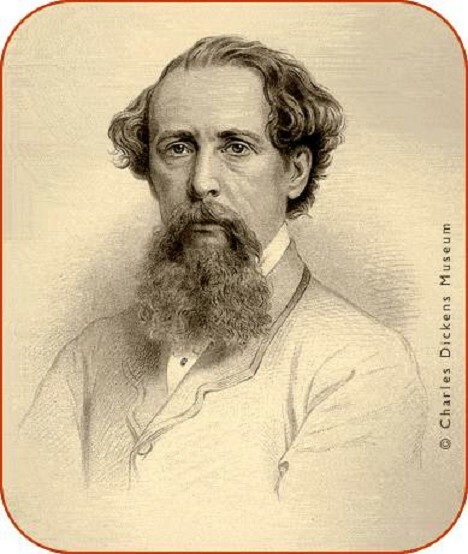 Dickens was motivated partly by a need to earn more money. His expenses were growing, and he owed money to his publishers Chapman and Hall. He came up with the notion of writing a small book for the festive season – a book that would have a Christmas theme. 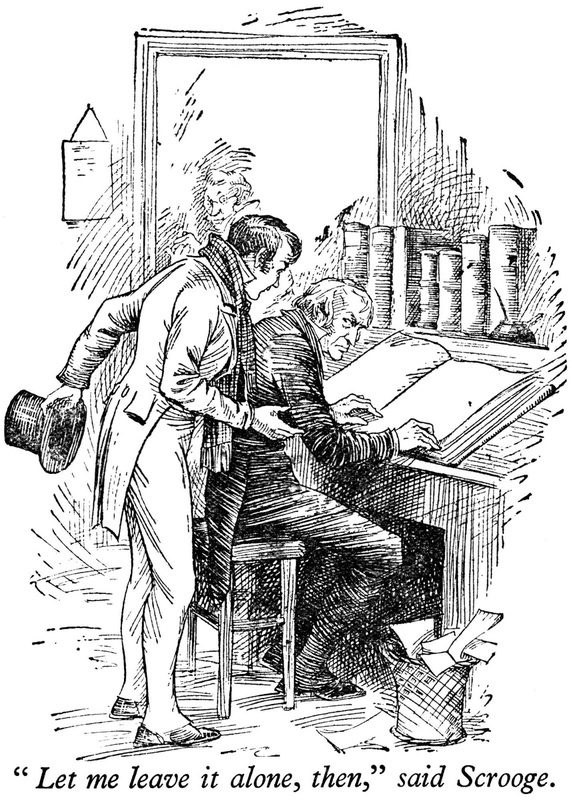 When he began work planning the book he was about half-way through his current novel, Martin Chuzzlewit – another of his large novels published in twenty monthly instalments. This new book would share the same themes as Martin Chuzzlewit: selfishness, the greed for money, and the commercialisation of social relations. It’s ironic that a book that promoted the Christmas values of giving and sharing, and explored themes of greed and poverty, was conceived of as a plan to make money by cashing in on the Christmas market! 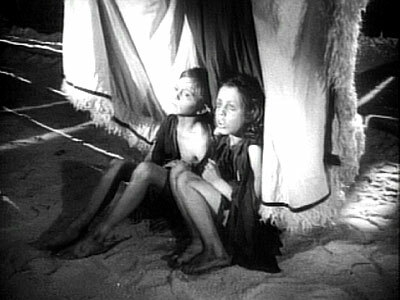 Near the conclusion of “Stave Three” of A Christmas Carol, the Ghost of Christmas Present reveals to Scrooge – from the voluminous folds of his long robe – two wretched children. “They were a boy and girl,” Dickens writes, “yellow, meagre, ragged, scowling, wolfish; but prostrate, too, in their humility.” Scrooge wonders whose they are. One of the charitable institutions active in Victorian Britain was the ragged schools movement. They provided free education for destitute children, and were active mostly in industrial cities. Dickens first became interested in the movement in 1843. He was a friend of the wealthy philanthropist Angela Burdett-Coutts. Starting in the early 1840s, he advised her on several charitable projects. Their association continued for almost twenty years. On her behalf, Dickens visited a school on Saffron Hill, which had been advertising for charity. It was one of the first so-called ragged schools. The school had been set up by Evangelicals. Dickens was appalled by what he called the “dire neglect of soul and body exhibited in these children.” The people living in the immediate neighbourhood of the school were immersed in “profound ignorance and perfect barbarism.” Dickens was determined to help alleviate these wretched conditions; it was the beginning of a long interest in the ragged school movement. 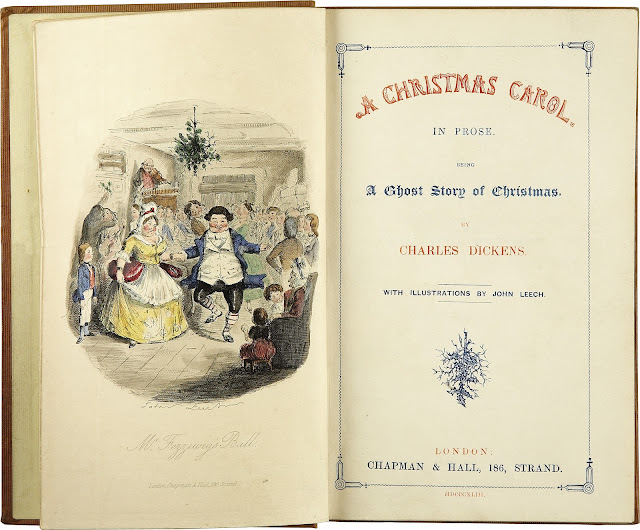 The plot of A Christmas Carol was derived primarily from the memory of the story of Gabriel Grub that Dickens had interpolated into The Pickwick Papers. Grub was a solitary and cold-hearted sexton, who experienced a change of attitude at Christmastime after being visited by several goblins, who showed him the past and future. Dickens was also influenced by Washington Irving’s Sketch Book (1820), which described the traditional old English Christmas. And Dickens found yet again ways to include elements of his own childhood into the story. Dickens began writing A Christmas Carol in September, 1843. It took him about six weeks to complete. It was unusual in that he completed it in one piece – it wasn’t created in many parts spread over a long period of time. It was an extended short story – a novella – divided into five sections. The full title of the piece is A Christmas Carol in Prose: Being a Ghost Story of Christmas. The five sections are called Staves – stanzas, or verses – in line with the work’s title. 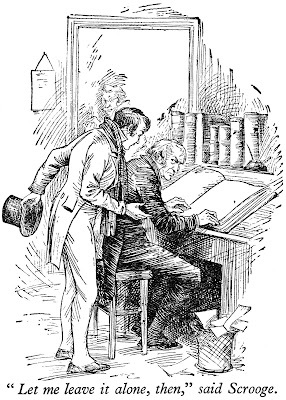 Dickens was intensely satisfied with the work he had produced. He decided to make sure that the published book looked really good. It was bound in red cloth, had a fancy gilt design on the cover, and the edges of the paper were treated with gilt. John Leech did four full-colour etchings and four black-and-white woodcuts for the book. The price was set at five shillings. A Christmas Carol turned out to be the most successful Christmas book of the season. The book was released on 19 December, 1843 - published by Chapman and Hall. By Christmas Eve it had sold 6,000 copies. A Christmas Carol didn’t make as much money that first year as Dickens had hoped. He was anticipating a profit of £1,000, but the production costs cut into the profits. The sale of the 6,000 copies only netted for its author £230. Two months after the book’s publication, Parley’s Illuminated Library printed a pirated version of the story. Dickens sued them and went on to win his case in court. But the pirates simply declared bankruptcy. Not only was Dickens cheated out of his financial settlement, he was also obliged to cover the £700 in legal costs. Eventually, though, Dickens would recoup his losses. The book would be a perennial favourite. It was also used to raise money for charity. In 1853 Dickens gave his first public reading as a benefit. He read A Christmas Carol in front of 2,000 working people at Birminghan Town Hall. He would perform the piece over and over – first as a means of supporting a variety of charities, and then as part of tours around the country designed to make money for its author. Once Dickens had begun writing A Christmas Carol it flowed from his pen with ease. He laughed and wept throughout its composition. And when it was done, he was elated. His closest friend, John Forster, recalled with what “a strange mastery it seized him.” It was because he imbued the story with memories of his own childhood experiences. The rescue of the adolescent Ebenezer Scrooge from school by ‘Little Fan’ recalled Dickens’s youthful yearning to be rescued from Warren’s Blacking Factory by his own sister Fanny. And the Cratchit family’s set up – living in a humble terraced house – recalled Dickens’s own family life on Bayham Street, shortly after they first arrived in London from Portsmouth. And Tiny Tim was a reference to Tiny Fred, the name of his younger brother, who was two years old when they moved to London. As Peter Ackroyd points out in his biography, Dickens created the character of Ebenezer Scrooge – the cold-hearted, money-obsessed skinflint – just at the time when he was desperate for money. Dickens was not a profligate, like his father. He was careful with his money. He had a long-standing fear of poverty – of falling back into the sort of financial ruin that his father had faced several times. So there was an ambivalence in his attitude to money. He yearned for it as a means of security and a mark of success, but he saw how it could corrupt the heart and the soul. Lots of money could lead to miserliness – a vice, or it could lead to generosity – a virtue. 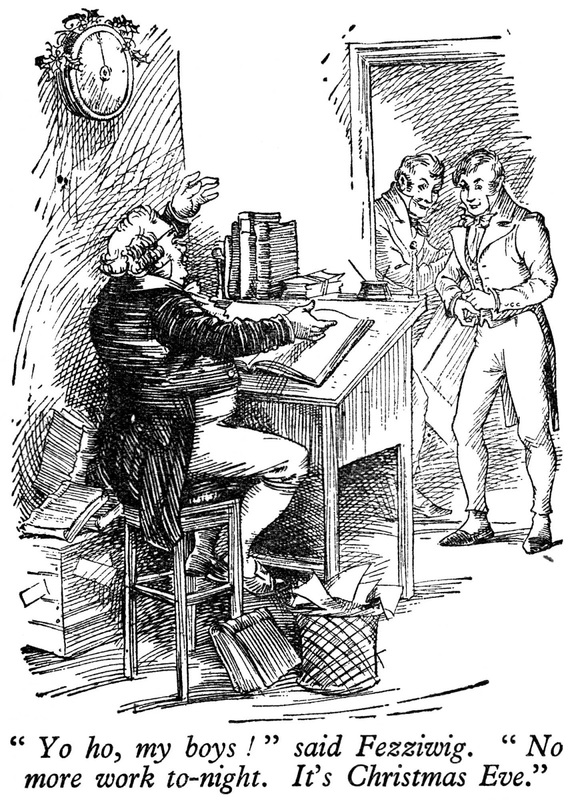 And the depiction of Scrooge as both a mean man (at the beginning of the story) and a generous man (once the three spirits have prompted his redemption) is a revealing depiction of Dickens himself – a professional man always looking for further success and money, but also a very generous man, who was always ready to help others. 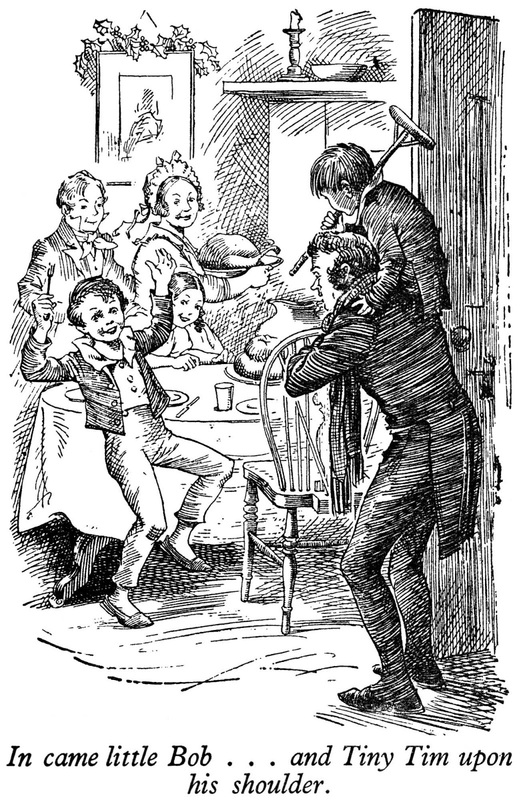 It has often been said that Dickens transformed the Christmas season by giving it a secular ethic. He promoted it as a time primarily of family get-togethers full of festive joy and material well-being. There had long been a rather sombre, puritan attitude to the season. But the Christmas holiday had been undergoing change – Prince Albert, Queen Victoria’s husband, had only recently introduced the German tradition of the Christmas tree. Christmas greeting cards were introduced that same year (1843). And the importance of Christmas carol singing was making a major comeback. A Christmas Carol became something of a national institution. And it exerted a long-lasting influence on the way the meaning of the season was perceived. 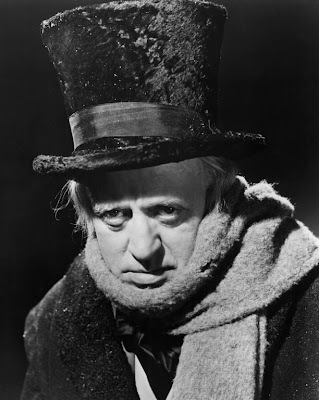 ﻿I first became aware of Charles Dickens through A Christmas Carol – not the book version, however, but the 1951 British film starring Alastair Sim (released as Scrooge in the UK, but known as A Christmas Carol in North America). In the days long before videocassettes and DVDs, you had to wait for TV stations to broadcast your favourite films. No worries about A Christmas Carol, though – they showed it at Christmas every year. And what a wonderful film it is. Alastair Sim is still the definitive portrait of this Dickensian character. You watch the film over and over, and you still delight in his work. My father used to read the story every year in the lead up to Christmas. It was a Christmas ritual for him. 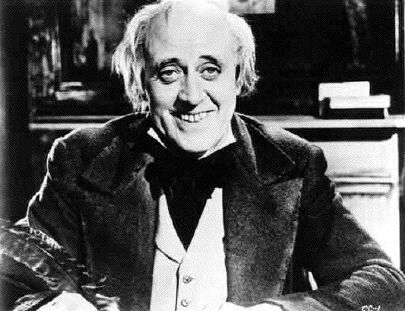 He also loved the filmed version with Alastair Sim. He particularly loved the final scenes, where the “new” Ebenezer Scrooge dances around the room in sheer joy that he has not missed Christmas day, and then leans out of the window and banters with a young boy – “An intelligent boy! A remarkable boy!" – about his arranging with the local butcher to send over the prize turkey that sits in his shop window. "... he knew how to keep Christmas well, if any man alive possessed the knowledge." A Christmas Carol is the concentrated essence of Charles Dickens. 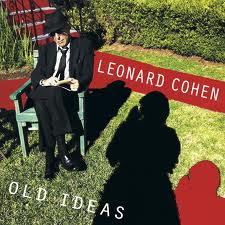 It has the humour, sentiment, and pathos of his humane characterisations. It has the vivid descriptions, the sharp dialogue, and the brilliant turns of phrase. It is also perhaps one of his most successful works of fiction, in the way that the characterisations and dialogue match perfectly with incident and plotline. 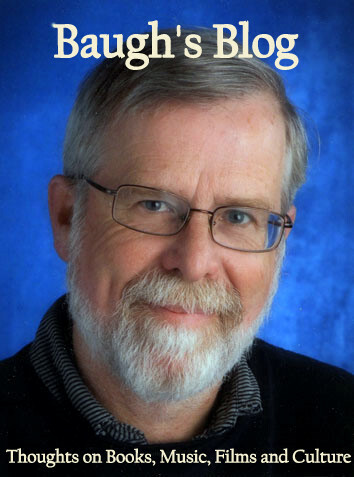 It’s worth reading as an introduction to the author. And it’s worth reading every Christmas season as an annual re-acquaintance with Dickens - the Great Spirit of Christmases Past, Present and Future. I read "A Christmas Carol" today, and absolutely loved it! I read this book on a most fitting trajectory. I started it on Christmas Eve, which is when the story begins, and ended it on December 26, which is when the story ends. It is not how I intended it, it is simply how it happened. My intention, actually, was to finish it in one sitting, but family commitments and the giddiness of the holiday prevented me from doing so. It was a light-hearted read with a very deep lesson. I loved the writing. It reminded me of why I love all of the other works by Charles Dickens. By the way, that image of Christmas present is somewhat how I imagined him as I read-- attired in green with luscious curls, as Dickens describes him. However, in this particular image you shared, he reminds me so much of Dionysus. Also, it is interesting to not the pose he is in-- the classical Baphomet pose, "as above, so below." 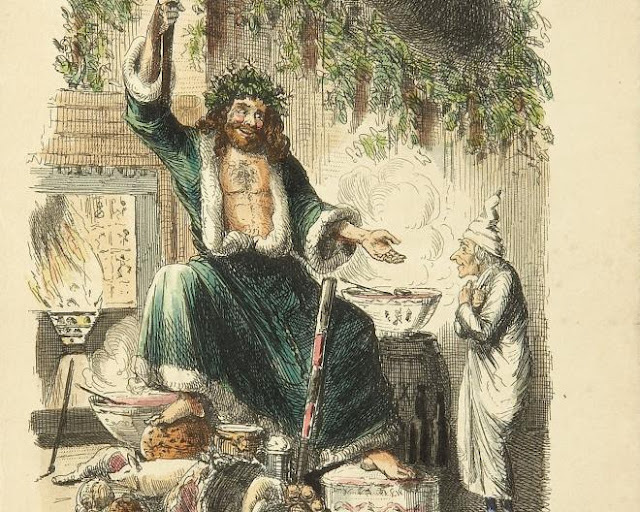 That image of the Ghost of Christmas Present in my blog post is one of the four full-colour etchings by John Leech that appeared in the original 1843 publication of the book.